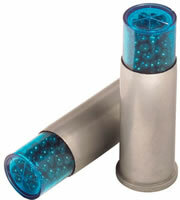 Details: Rigid plastic shot capsules that breaks on the rifling. Flexible base wad prevents gas blow-by. Reliable CCI primers. Residue removes with normal cleaning methods.